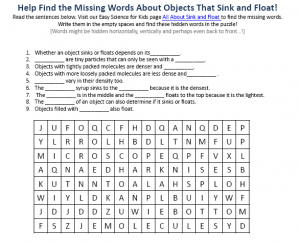 Sink and Float – Download the FREE Hidden Word Search Science Worksheet for Kids. Our word search puzzle about float or sink is free to download and print. This word search activity sheet is great for teaching preschoolers facts about sink and float. The kids can have fun learning while playing the game! The Sink and Float hidden word searches worksheet is suitable for Grammar & Primary school kids in Grades 1-5 as well as Pre-K and Kindergarten kids. Kindergarten and Pre-K kids can enjoy this sink and float preschool activities worksheet as a listening comprehension tool while learning to recognize and identify letters and words. Grammar school kids can use sink and float worksheets as a reading comprehension activity. Our Science for Kids website is a great teacher resource for science worksheets, science games for kids, free word games and online word search puzzles. When objects are placed in the water, some objects sink while others float. Certain factors cause these objects to sink. Find out what these facts factors are, with this downloadable hidden words game worksheet! [sociallocker]Download fun easy science word game activity sheets about float or sink. Download the FREE Sink and Float Worksheet! Liked this free Sink and Float worksheet? Click here for lengthy scientific information about float and sink. Declan, Tobin. " Sink and Float - Free Hidden Wordsearches Science Worksheet - ." Easy Science for Kids, Apr 2019. Web. 21 Apr 2019. < https://easyscienceforkids.com/sink-and-float-free-hidden-wordsearches-science-worksheet/ >.